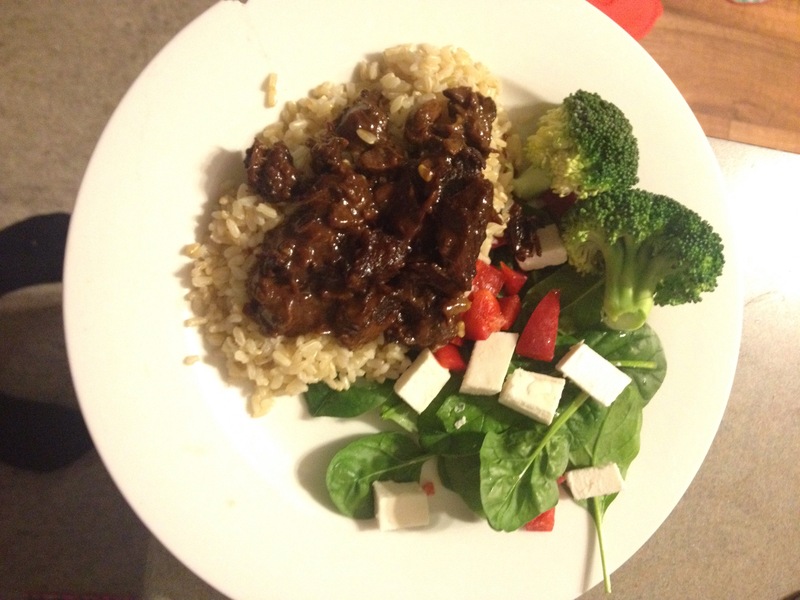 Slow cooker | Have kids, they said. It'll be fun, they said. 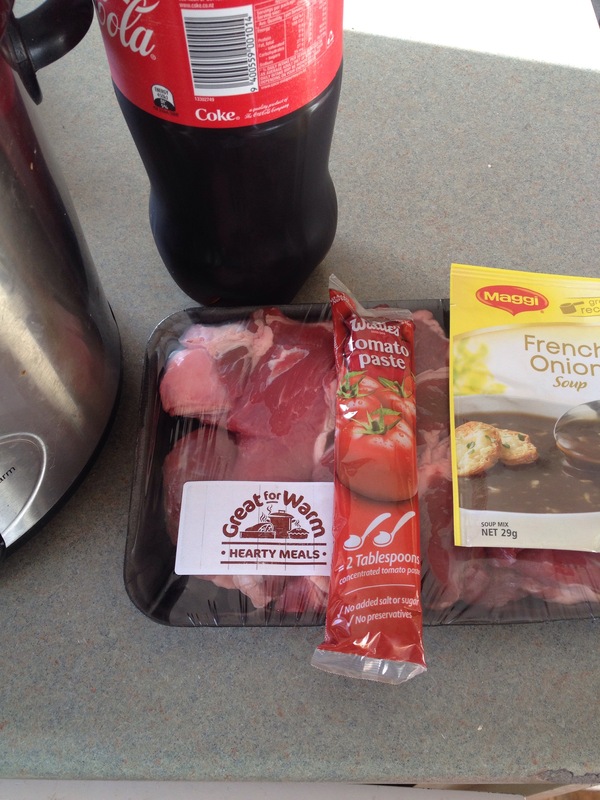 I found a really neat recipe on the website of The Stay At Home Mum for slow cooker Coca-cola beef. I was like, ohhhhhhhhhhhhhhh yes. I am a big fan of Coca Cola Chocolate Cake, and also using coke to make chicken as well. So I was very keen to give this a whirl. It was so easy and really tasty. Place the soup sachet into the slow cooker and add the diced beef. Stir until the soup mixture coats the beef. Add the coke and cook on high for 6 hours. At the 6 hour mark, stir in the tomato paste. The recipe now calls for another 2 hours on high, but I found that my meat was starting to dry out by this stage, so I would recommended either on low, or cook for less time. 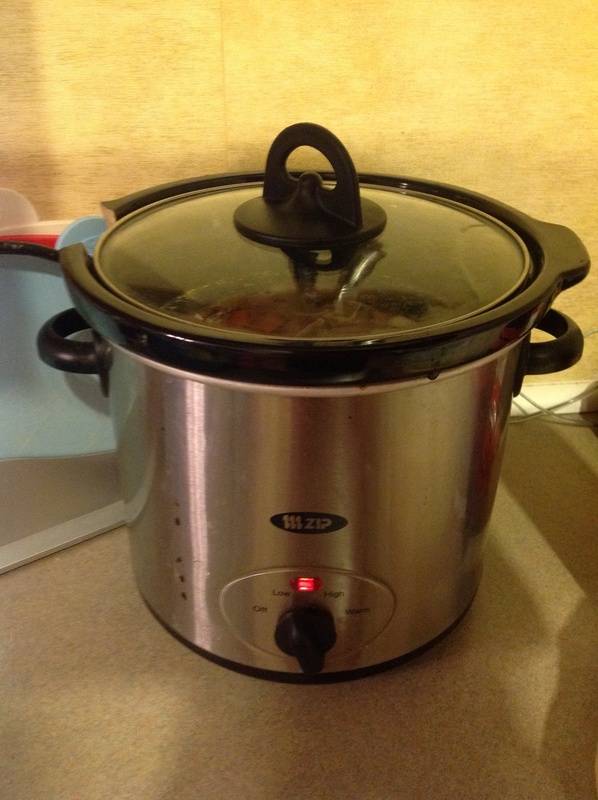 If you are using a bigger slow cooker, you may want to add more liquid too. I wish I’d had potatoes because this would have been amazing served on creamy mashed potatoes. We served it on rice and it was really, really good. Princess and Babygirl wolfed it back, as did Mr T.
I made stock. All my by myself. Martha Stewart, eat your heart out. 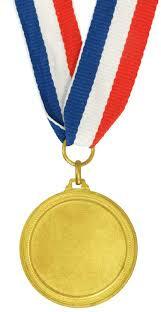 Why yes, I would love a medal for my efforts. Thank you. On with the show. I was super excited when I got up this morning, the house had an amazing aroma of roast chicken after the stock had sat in the crock pot all night. If you ever want to give the illusion of cooking a meal when people visit your house, put a chicken carcass in the slow cooker! I turned off the slow cooker once I was up and let it sit for the morning to let it cool. 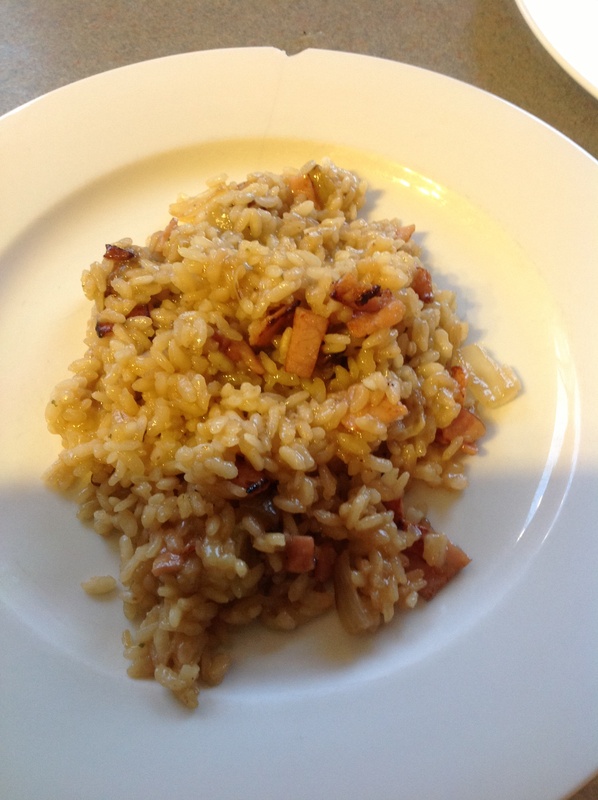 I decided to make Bacon Risotto for dinner, using the stock I had made. Put the chicken carcass into the slow cooker and roughly chop a carrot and an onion and put them in there as well. Sprinkle over some rosemary and then cover with water, right up until the top of the slow cooker, leaving only an inch or so at the top. Cook on Low heat overnight (or, 8-10 hours if doing this during the day). When the stock is done and cooled, strain it to get rid of all the chunky bits and bones. Store. Yum. As I said, it smelt amazing. And so easy, I don’t know why I have never done this before. My only disappointment was that, in deciding to use the stock for risotto, I now have none left. I was so looking forward to freezing it for future use! Never mind, I guess I will have to do it again. Cook the diced onion in a pan until cooked through and then add the diced bacon. When both are cooked, remove and set aside. In the same pan, cook the rice until it is browned and slightly transparent. Add 1 cup of stock and stir until completely absorbed into the rice. Add another cup, and once again stir. Continue this for around 20 minutes, or until the rice is cooked and creamy and the stock is absorbed. 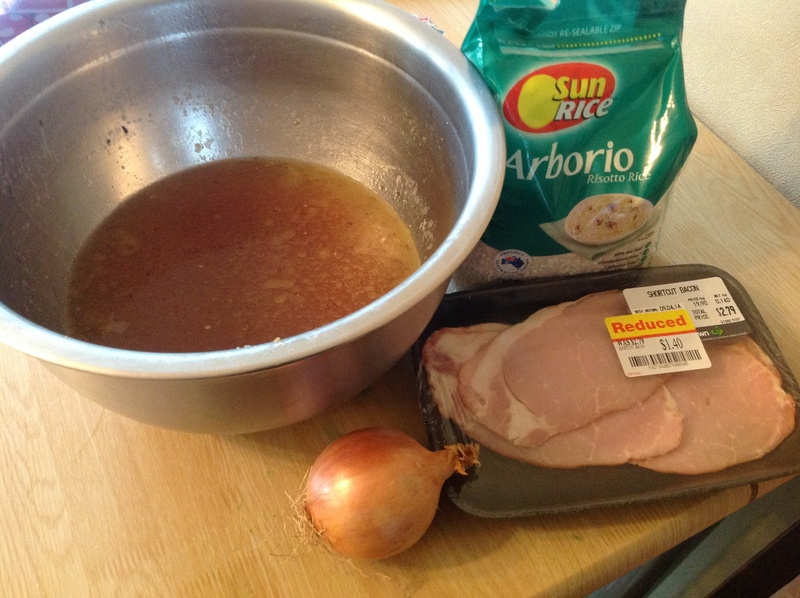 Once the rice is cooked to your liking, re-add the onion and bacon to the pan. It was at this point that I separated out a serving for the dairy-free people, then added in some grated cheese to allow it to melt through the rice. Amazing. I thoroughly enjoyed this meal, it was really, really delicious. The stirring is an arduous task but I can’t take credit for that – Aunty M happily stirred the rice while I juggled the children away from the kitchen. Not a meal to make when home alone with three pre-schoolers! Very nice, and definitely something I will make again. I want to be more creative with the flavouring, perhaps a chorizo risotto would be nice. Four more meals to go on our journey of No Takeaways. Mr T is counting down the minutes until he gets his Fish and Chip dinner! 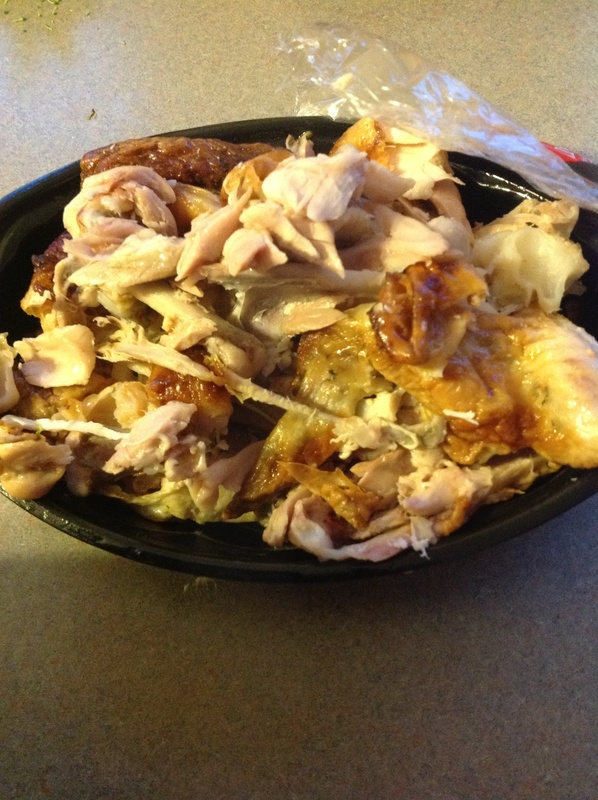 Mr T really wanted rotisserie chicken and coleslaw from the supermarket for his dinner tonight. Like, he really wanted it. I did consider for a fleeting moment buying the chicken and then passing it off as my very own roast, but no. That would go against everything this blog stands for! I can’t lie, I have the worst poker face around. Besides, since I began this daily food blog, one of the big things I wanted to try was using a chicken carcass to make chicken stock. My amazing friend (from whom this blog is largely inspired) does this, as do many other people, so I thought getting a chicken from the supermarket was a good excuse to finally try it. The idea of dealing with a chicken carcass made me feel a bit ill, but I’m going to put my big girl knickers on and do it anyway. When I say Mr T wanted chicken and coleslaw for dinner, he quite literally meant, just chicken and coleslaw. He has a cold, you see, and that is what he felt like eating. 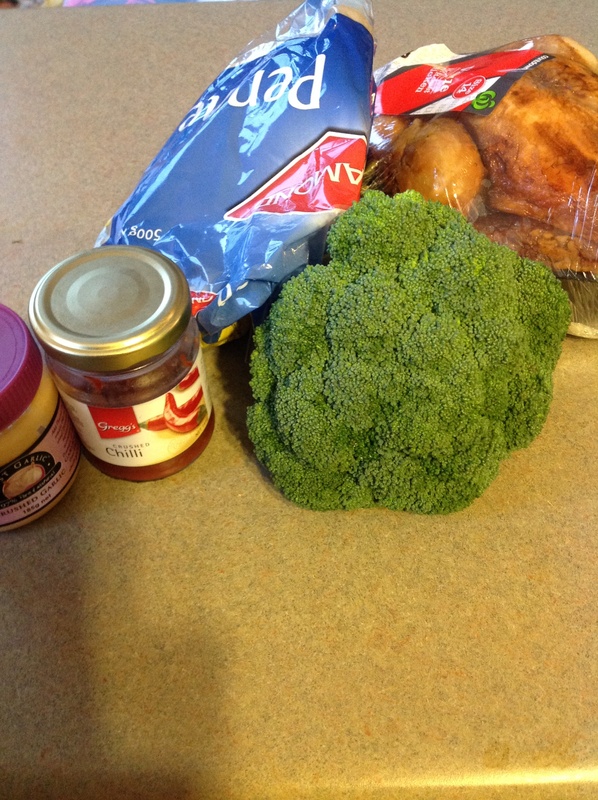 I got some broccoli from the supermarket for cheap today and wanted to incorporate that into the meal somehow. Also, I didn’t want a meal of chicken and coleslaw, so I decided to make a Chicken and Broccoli Pasta for myself. And then, attempt to make chicken stock. Put the pasta on to cook, by placing it into a pot of boiling water. In a saucepan, cook the garlic and chilli for a minute, then add the broccoli florets and sear on a high heat until cooked but still crunchy. When the pasta is cooked, drain the water and then toss through a little bit of oil. Mix in the broccoli, garlic and chilli. 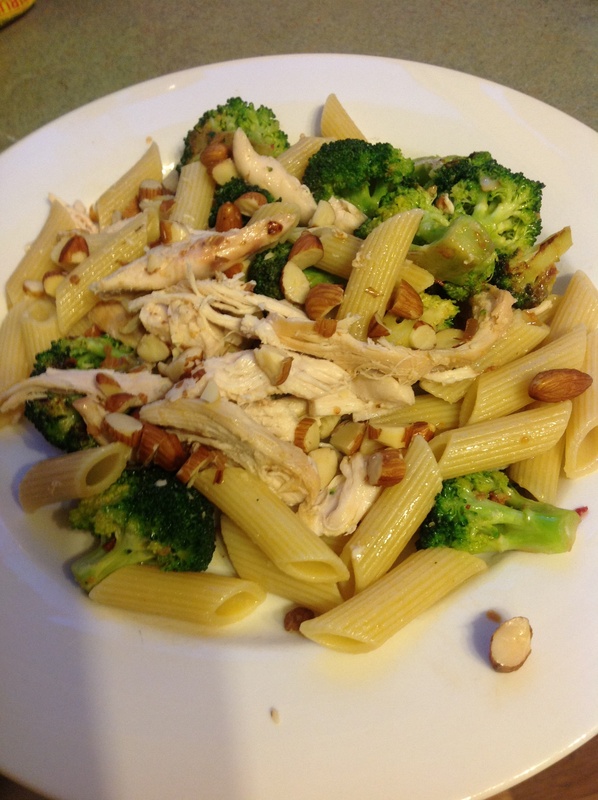 Serve with almonds scattered on top. I thought this was really nice! So simple and really quite delicious. I can’t ask the opinion of anyone else because no one else wanted any! Such is life. They all loved their chicken but I can’t take any credit for that one! And, because I’m so proud of my effort, the stock is happily chugging away in the slow cooker. I can’t wait to see what it is like tomorrow, and I’m excited to cook with the stock tomorrow night – Mr T is working but my Aunty is coming to stay. I hope she likes risotto!